Along with great apes, elephants and humans, common bottlenose dolphins have one of the most sophisticated intellects on our planet. Exploited by the ‘entertainment’ industry for years, common bottlenose dolphins are the most widely recognised species of dolphin. Watching a pod of common bottlenose dolphins hunting or playing together is an experience that will stay with you for life. 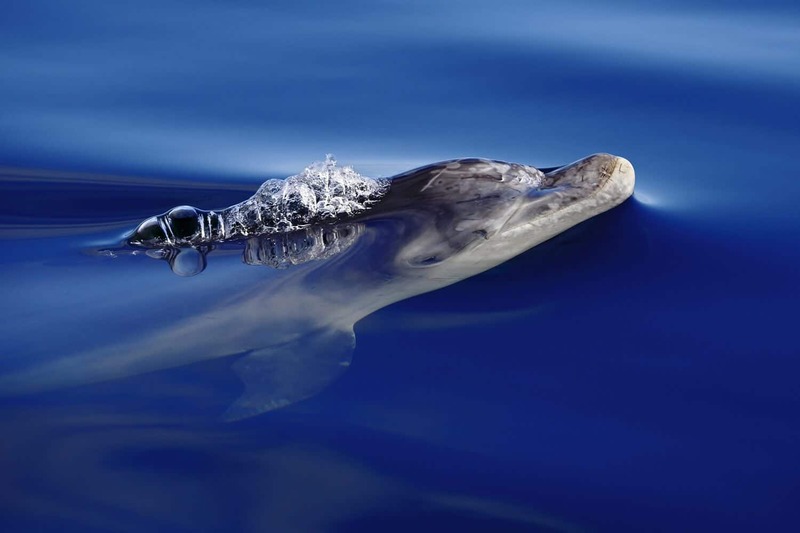 If you imagine a dolphin, it’s likely you are picturing a common bottlenose dolphin. 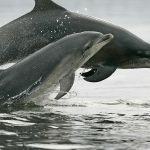 Because of films and TV shows like Flipper and decades of exploitation for human amusement, bottlenose dolphins are the most recognisable of all dolphin species. They are generally relatively large, chunky individuals with a dark grey back and paler belly. They have a short, stubby beak and that endearing mouth shape that makes them look as though they are smiling – an unfortunate feature if you think about how attractive that ‘smile’ has made them to the ‘entertainment’ industry. Individuals can be recognised by distinct notches and markings on their dorsal fin, as unique as our fingerprints. What’s life like for a bottlenose dolphin? 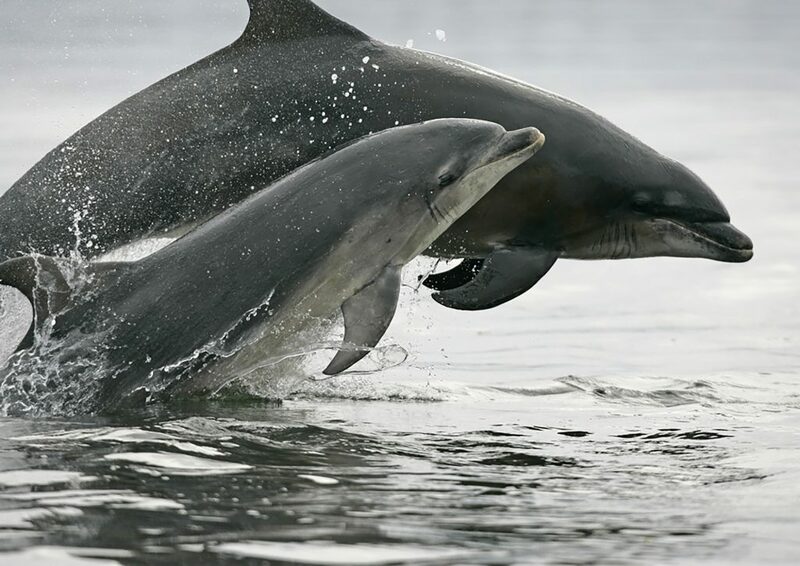 If you are a bottlenose dolphin, your family and friends are vital. You rely on them for companionship and fun, and they also help you to find and catch food. They babysit your kids when you need to scope out new hunting grounds, and they will rally round when you are sick. Although some individuals choose to live alone, by far the majority are highly social and will also associate with other species of dolphins, whales and even sharks and turtles. Some even cooperate with humans to catch fish. 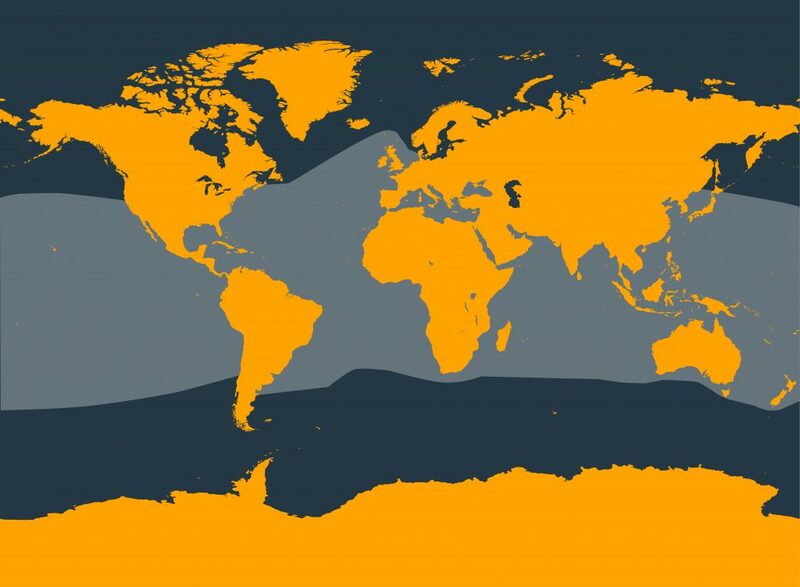 What a bottlenose dolphin eats will depends on where they live. For the most northerly resident population of common bottlenose dolphins in Scotland’s Moray Firth, there’s nothing better than a plump tasty salmon. For others it’s squid and crustaceans. They swallow their food whole and if you watch a dolphin hunting fish, you will often see them tossing it into the air to get a better angle so that it slides down their throat more easily. Mothers will spend years teaching their calves the best places to go to find food, and passing on tips and tricks for successful hunting. These dolphins make their homes all over the world. The only areas they don’t live – understandably – are the very cold waters of the Arctic and Antarctic circles. Some groups choose to stay in one place all their lives while others are more transitory. They live in many different environments including coastal areas, in harbours, bays, lagoons and semi-enclosed seas such as the Black Sea and the Mediterranean Sea. Although globally they are numerous compared to many species of whales and dolphins, some populations are small and isolated, and especially vulnerable to human activities like hunting, noise pollution or fishing. There is only one resident population left in the North Sea, and the Black Sea sub-species is classified as Endangered. Each common bottlenose dolphin has his or her own name. This is a unique set of whistles used by the other dolphins to refer to or attract the attention of a particular individual. A group of common bottlenose dolphins in Shark Bay, Australia hold sponges to stop their beaks getting scratched and cut when they search for food on the rocky seabed. This unique hunting technique was started by a single female dolphin who taught her daughter to do it and eventually spread the useful custom to the whole group. This is an example of culture - new behaviour that is invented and passed on through learning – something we know is also important to chimpanzees and humans. 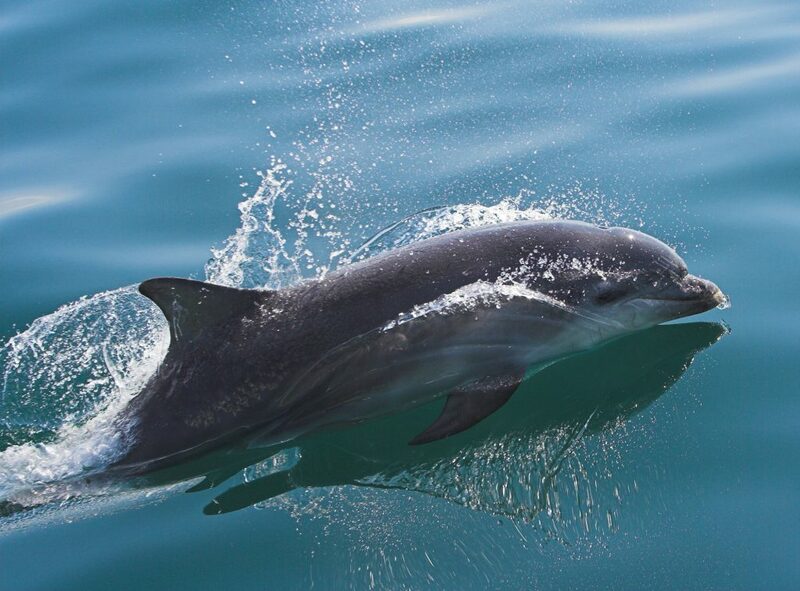 You’ll have heard stories about dolphins rescuing humans in trouble at sea, but did you know bottlenose dolphins have been known to come to the aid of other whale or dolphin species? One dolphin known to locals as Moko, helped two pygmy sperm whales who had beached in New Zealand. According to reports, a group of people had been trying in vain to get the whales back out to sea, but it was looking hopeless until Moko appeared and led them to safety. A witness said that the whales visibly changed their attitude from being distressed to following Moko willingly. Bottlenose dolphins have special brain cells called spindle neurons. Humans and great apes have them too, and scientists think they enable us to feel complicated emotions and also to understand and relate to how others are feeling (empathy). 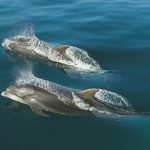 Studies have led some researchers to suggest that bottlenose dolphins may experience emotions on a level far greater than humans and have much deeper and more complex social bonds than we do. It’s this amazing discovery that motivates many to call for their rights to be legally recognised. Bottlenose dolphins face numerous threats from entanglement in fishing gear to hunting and captivity. All a result of humaOrcas are at the top of the food chain, and they have no natural predators. But orcas face a number of serious threats – all of them from humans. Captivity – bottlenose dolphins are still taken from their families for a life of imprisonment entertaining humans. They are the most commonly-held species of whale or dolphin in captivity, with over a thousand held around the world for shows and interaction programmes in facilities which do not meet their basic biological needs. Hunting - thousands of dolphins are hunted and killed every year for their meat. 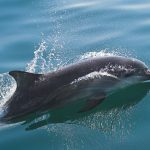 Pollution - toxic chemicals from plastic, litter and oil spills build up in common bottlenose dolphins, seriously harming their health and their ability to have young. 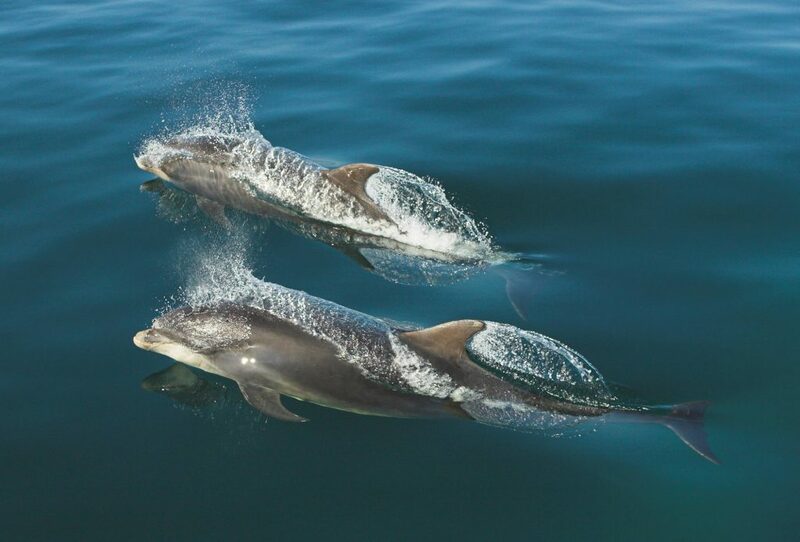 Noise pollution – bottlenose dolphins rely on sound to navigate and communicate. Noise from military sonar, oil and gas drilling and exploration and shipping can disrupt them and even cause them to strand.